Clive offers a range of garden maintenance services : Lawn Mowing, Garden Clearance, Hedge Cutting, Turfing & Pressure Washing and more. Clive joined Ed's in 2007 and runs his garden maintenance business in the Hampton area. 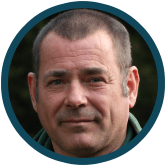 Clive combines a true passion for gardening with lots of experience to provide an excellent service for his customers. Requested a quote on the website last night, and Clive popped in today. Very friendly a...nd knowledgeable! Will definitely be using Clive’s services. Hi Clive I have today transferred the last payment to you, feels like the end of an er...a!! I have thoroughly enjoyed our working relationship over the years and Maryon and I thank you for all your good work in our garden. The Mitchell-Innes�s were ecstatic with your pressure wash for which many thanks. I felt very embarrassed in leaving the property so grubby. All the very best for the future and if you continue to look after Common Road remember I will be looking over your shoulder! !